Tag Archive | "U-shaped line"
by Huy Duong | The Diplomat Blog – Late last month, tension in the South China Sea was ratcheted up a further when three Chinese marine surveillance ships threatened the Vietnamese seismic survey ship Binh Minh 02 and sabotaged its seismic equipment. 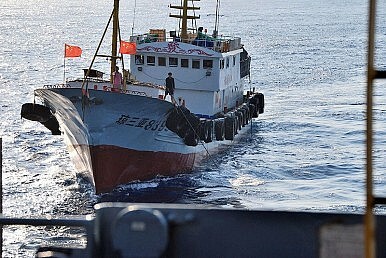 The incident took place 120 nautical miles from Vietnam’s mainland coast and 340 nautical miles from China’s Hainan Island, well inside Vietnam’s 200-nautical-mile exclusive economic zone (EEZ). For anyone wondering if this incident is somehow tied to the Paracels and Spratlys disputes, then the answer is no. 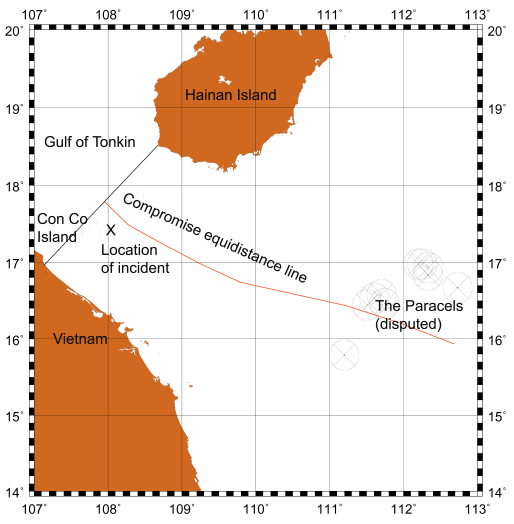 The Binh Minh incident took place closer to the Vietnamese coast than the Paracels or the Spratlys. According to international law and state practice, the Spratlys and Paracels’ islands and rocks are only entitled to either a territorial sea of 12 nautical miles or, at most, a territorial sea plus an EEZ that doesn’t extend much beyond 12 nautical miles. By no stretch of the imagination, then, could their EEZs extend to or past the midlines between them and the coastlines surrounding the South China Sea. With this in mind, it has been interesting to follow the ensuing war of words between Vietnam and China. On May 27, Vietnam sent a diplomatic note to the Chinese Ambassador in Hanoi accusing China of violating the United Nations Convention on the Law of the Sea (UNCLOS) and Vietnam’s sovereign rights in its exclusive economic zone and continental shelf. But as ‘jurisdictional sea area’ isn’t one of the maritime zones defined in the UNCLOS, it remains unclear what exactly China meant by that term, and what might be the legal basis for it. Effectively, Vietnam was saying that the area wasn’t part of the Paracels and Spratlys disputes. Once again, China failed to state its claim in terms of UNCLOS maritime zones. Nor did it specify any limit or cite international law to support its claim. This latest development bears a striking resemblance to the Reed Bank incident in March, when two Chinese patrol boats threatened a seismic survey ship operating on behalf of the Philippines. That incident also took place nearer to the Philippines’ Palawan coast than to the contested Spratlys. In both cases, China asserted its claims without any limit or justification based on the UNCLOS or international law. 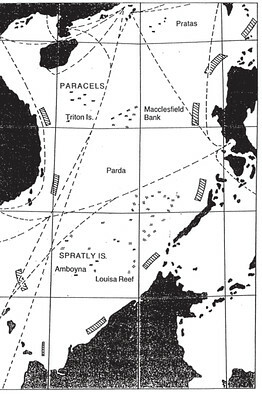 The Philippines’ riposte was that the Reed Bank isn’t part of the Spratlys and therefore isn’t subject to the Spratlys dispute. In the past, China has made similar claims against Malaysia at James’ Shoal, against Indonesia over the waters near the Natuna Islands, and against Vietnam in the Vanguard Bank and Blue Dragon areas. These claims, together with the Reed Bank and Binh Minh incidents, should dispel any doubts that China is trying to expand its control well beyond the disputed Paracels, Spratlys and Scarborough Reef, and their associated waters. A common feature with all these claims and clashes is that they all involve areas inside the mysterious ‘;U-shaped line&#8217; that, some time during the last century, China started putting on its maps. Over the years, this U-shaped line gradually expanded until it covered most of the South China Sea, to within less than a hundred nautical miles of other countries’ coastlines, without any justification based on international law or customs. Although the Philippines, Vietnam, Malaysia, Indonesia and Brunei are all directly affected by this expansionist policy, the first two, being the countries that are nearest to China, will bear the brunt of Chinese expansion, for a number of reasons. First, these two nations’ maritime spaces will clearly be affected the most. Second, if China doesn’t try to claim the Philippines and Vietnam’s maritime spaces, its claims over Malaysia’s, Indonesia’s and Brunei’s will disintegrate. This means that while China might make compromises at the southern tip of its notorious U-shaped line to keep Malaysia, Indonesia and Brunei quiet while it deals with the Philippines and Vietnam first, it can’t do the reverse and give up its claims in the Philippines’ and Vietnam’s maritime spaces in order to gain the southern tip. Of course, if China is successful in getting its way against the Philippines and Vietnam, Malaysia’s, Indonesia’s and Brunei’s turns will come. As a result, both the Philippines and Vietnam have been put in a situation where they need to resolutely protect their legitimate maritime spaces. At stake are more than economic interests: they also have reasons to fear that their security and national independence are threatened. Although there remain differences between the Philippines and Vietnam over the Spratlys, there’s much more scope for the two nations to co-operate in defending their respective maritime spaces that don’t belong to the Spratlys. Given China’s extensive claims, these maritime spaces may be far more significant than those belonging to the disputed Spratlys. The Philippines’ note verbale to the Commission on the Limits of the Continental Shelf after the Reed Bank incident highlights how the country is using UNCLOS to defend its rights in the South China Sea. With Vietnam relying on the same body of law, the two nations have a common framework for co-operation. For example, if Vietnam and the Philippines could voice their diplomatic support for each other in incidents such as the Reed Bank and Binh Minh ones, it would benefit both nations. More fundamentally, though, analysts and diplomats from the two nations should get together with their counterparts from Malaysia, Brunei and Indonesia to decide what exactly the Spratlys consist of and how much maritime space can be attributed to them, which would lead to a collective agreement on the extent of the contested areas in the South China Sea. This will help these nations in individually and collectively opposing China’s attempts to expand the South China Sea dispute into previously uncontested areas. It will also help to convince the world of the merit of their case. Another path that the Philippines and Vietnam could explore is making joint submissions of their continental shelf claims to the Commission on the Limits of the Continental Shelf, possibly with the participation of Malaysia and Brunei. Either of these actions would be without prejudice to the question of sovereignty over the Spratlys, and would benefit the Philippines and Vietnam enormously in counteracting China’s expansive claims in the South China Sea.